Do you want to track outbound links in WordPress? Outbound links are the links that take users away from your website. These could be links to affiliate products, social networks, or simply other websites that you have linked to from your website. In this article, we will show you how to easily track outbound links in WordPress to see which outbound links get the most clicks. After you build your website, you need to learn how users interact with your website, so you can grow it. The best way to do this is by using Google Analytics. It allows you to see where your users are coming from, what pages they are viewing, and how much time they are spending on your website. This information helps you adjust your strategy and improve your website accordingly. Similarly, learning about outbound or external links can help you understand which outgoing links are clicked more often. 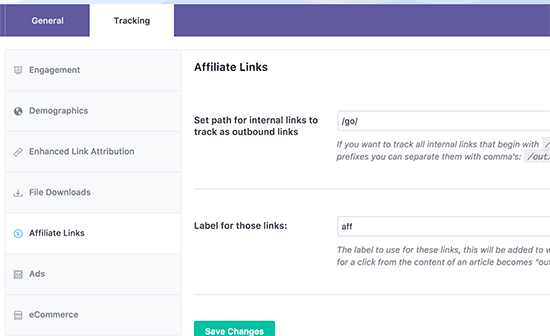 If you recommend affiliate products, then tracking outgoing links help you learn which products perform better with your audience. 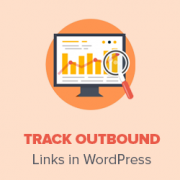 Having said that, let’s take a look at how to easily track outbound links in WordPress. First, you will need to install and activate the MonsterInsights plugin. There is a free version as well which you can use. For more details, see our step by step guide on how to install a WordPress plugin. MonsterInsights is the most popular Google Analytics plugin for WordPress. It allows you to properly connect your website with Google Analytics. For complete setup instructions, see our step by step guide on how to install Google Analytics in WordPress. Upon activation, you need to visit Insights » Settings page in your WordPress admin area and click on the ‘Tracking’ tab. 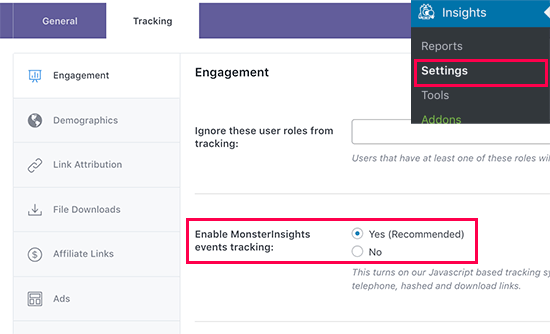 Under the ‘Engagement’ section, you need to select ‘Yes’ next to the ‘Enable MonsterInsights events tracking’ option. That’s all, you have enabled outbound link tracking on your WordPress site. By default, Google Analytics doesn’t track these URLs as outbound links, so they will not appear under your outgoing-link reports. MonsterInsights allows you to easily fix this. Head over to Insights » Settings page and then click on the ‘Tracking’ tab. The tracking page is divided into different sections. Click on the ‘Affiliate Links’ section to continue. Now you need to provide the path that you use for your affiliate links. This is the prefix added by your link cloaking or affiliate link manager plugin. After that you need to provide a label for those links. This label will be added to your Google Analytics report and will help you identify those links in your reports. If you have just enabled outbound link tracking on your WordPress site, then allow Google Analytics at least 24 hours to collect the data. After that you can login to your Google Analytics dashboard and click on Behavior » Events » Top Events page. You will see your outbound links listed as ‘outbound-link’ event category and your affiliate links will be listed with the label you added in plugin settings. Clicking on it will show you the URLs users clicked on your website. You can also view outbound link activity in real time. Inside your Google Analytics dashboard, simply go to the Real-time » Events page. 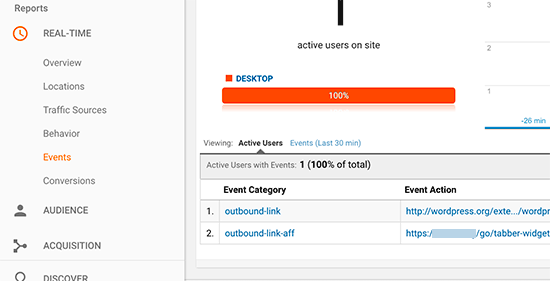 You will see your outbound link, and your outbound affiliate links reported as events. 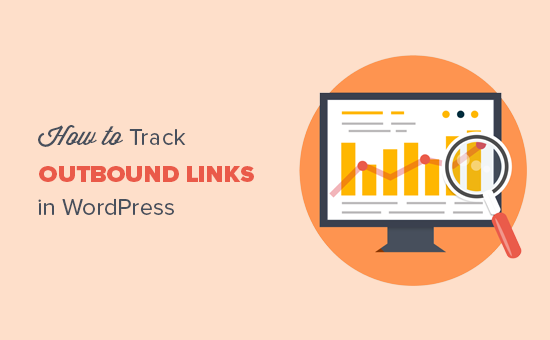 We hope this article helped you learn how to track outbound links in WordPress. You may also want to see our ultimate step by step WordPress SEO guide for beginners. I recently download monsterinsight, but it do not have ‘Track outbound clicks and download links” under “Engagement’ section. So it is not possible now? It is now called ‘Enable MonsterInsights events tracking’ option. We have updated the screenshot to reflect that. I can not find any info on how you would do this in WP or find a plugin that will do it. Any ideas, i looked at those links posted but they wont help. The number of clicks on my links in GA is less than what my plugin (pretty links) shows it to be. Around 20% less. Do you have any idea how that can be or what might be the reason?